hacker-roadmap | :pushpin: A guide for amateurs pen testers and a collection of hacking tools, resources and references to practice ethical hacking, pen testing and web security. This repository is a overview of what you need to learn penetration testing and a collection of hacking tools, resources and references to practice ethical hacking. Most of the tools are UNIX compatible, free and open source. If you’re new to information security, forget everything you know about hacking. Don’t start using tools without reading about pen testing and how it works (see Additional resources section). Don’t download and use tools that you don’t audited the code. Don’t use these tools to do stupid things like investigating/hacking without consent on your friends, or worst, your recruiter. Read books, manuals, articles, be curious and not just a scritpt kiddie. I wish you don’t use these tools for illegal purposes, but if you do, I sure hope you know what you do. Want to become a penetration tester ? Know about risks on the internet and how they can be prevented is very useful. Especially as a developer. Web hacking and penetration testing is the v2.0 of self-defense! But does know about tools and how to use them is really all you need to become a pen tester? Surely not. A real penetration tester must be able to proceed rigorously and detect the weaknesses of an application. He must be able to identify the technology behind and test every single door that might be open to hackers. 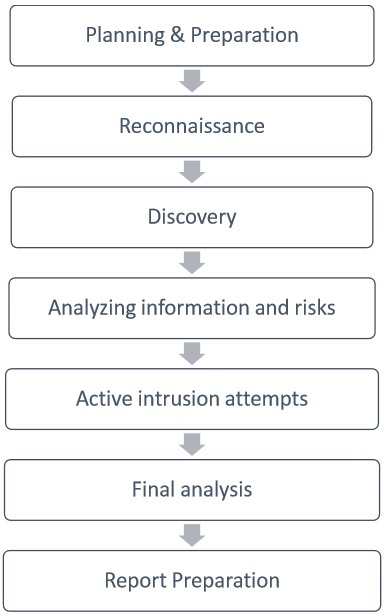 This repository aim first to establish a reflection method on penetration testing and explain how to proceed to secure an application. And secondly, to regroup all kind of tools or resources pen testers need. Be sure to know basics of programming languages and Internet security before learning pen testing. Also, this is important to inform yourself about the law and what you are allowed to do or not. According to your country, the computer laws are not the same. First, check laws about privacy and surveillance : Nine eyes countries, Five eyes and Fourteen Eyes. Always check if what you’re doing is legal. Even when it’s not offensive, information gathering can also be illegal ! Black/grey/white hat hacker : Someone who uses bugs or exploits to break into systems or applications. The goal and the method differs depending if he’s a black, grey or white hat hacker. A black hat is just someone malicious that does not wait permission to break into a system or application. A white hat is usually a security researcher who practice ethical hacking. A grey hat is just in the middle of these two kind of hackers, he might want to be malicious if it can be benefit (data breach, money, whistleblowing …). Penetration tester : An ethical hacker who practice security, test applications and systems to prevent intrusions or find vulnerabilities. Security researcher : Someone who practice pen testing and browse the web to find phishing/fake websites, infected servers, bugs or vulnerabilities. He can work for a company as a security consultant, he is most likely a Blue teamer. A black hat is practicing penetration testing, but unlike a white hat, this is not ethical hacking. Ethical hacking is about find vulnerabilities and improve the security of a system. An ethical hacker is the ultimate security professional. Ethical hackers know how to find and exploit vulnerabilities and weaknesses in various systems, just like a malicious hacker (a black hat hacker). In fact, they both use the same skills; however, an ethical hacker uses those skills in a legitimate, lawful manner to try to find vulnerabilities and fix them before the bad guys can get there and try to break in. An ethical hacker is basically a white hat hacker. These are the most used Content Management Systems (CMS). See a complete list here. Information Gathering tools allows you to collect host metadata about services and users. Check informations about a domain, IP address, phone number or an email address. Th3inspector Perl Linux/Windows/macOS All in one tool for Information Gathering written in Perl. Crips Python Linux/Windows/macOS IP Tools To quickly get information about IP Address’s, Web Pages and DNS records. theHarvester Python Linux/Windows/macOS E-mails, subdomains and names Harvester. Scanless Python Linux/Windows/macOS Online port scan scraper. CTFR Python Linux/Windows/macOS Abusing Certificate Transparency logs for getting HTTPS websites subdomains. Sn1per bash Linux/macOS Automated Pentest Recon Scanner. ReconDog Python Linux/Windows/macOS Recon Dog is an all in one tool for all your basic information gathering needs. RED Hawk PHP Linux/Windows/macOS All in one tool for Information Gathering, Vulnerability Scanning and Crawling. A must have tool for all penetration testers. Infoga Python Linux/Windows/macOS Email Information Gathering. KnockMail Python Linux/Windows/macOS Check if email address exists. Photon Python Linux/Windows/macOS Crawler which is incredibly fast and extracts urls, emails, files, website accounts and much more. Rapidscan Python Linux/Windows/macOS The Multi-Tool Web Vulnerability Scanner. a2sv Python Linux/Windows/macOS Auto Scanning to SSL Vulnerability. Wfuzz Python Linux/Windows/macOS Web application fuzzer. Nmap C/C++ Linux/Windows/macOS Scanner ports vulnerability. Crack passwords and create wordlists. John the Ripper C Linux/Windows/macOS John the Ripper is a fast password cracker. hashcat C Linux/Windows/macOS World’s fastest and most advanced password recovery utility. ophcrack C++ Linux/Windows/macOS Windows password cracker based on rainbow tables. Ncrack C Linux/Windows/macOS High-speed network authentication cracking tool. WGen Python Linux/Windows/macOS Create awesome wordlists with Python. SSH Auditor Go Linux/macOS The best way to scan for weak ssh passwords on your network. Probable Worlist Wordlists sorted by probability originally created for password generation and testing. Used for intrusion detection and wifi attacks. Aircrack C Linux/Windows/macOS WiFi security auditing tools suite. bettercap Go Linux/Windows/macOS/Android bettercap is the Swiss army knife for network attacks and monitoring. Airgeddon Shell Linux/Windows/macOS This is a multi-use bash script for Linux systems to audit wireless networks. Airbash C Linux/Windows/macOS A POSIX-compliant, fully automated WPA PSK handshake capture script aimed at penetration testing. Acesss systems and data with service-oriented exploits. SQLmap Python Linux/Windows/macOS Automatic SQL injection and database takeover tool. XSStrike Python Linux/Windows/macOS Advanced XSS detection and exploitation suite. Listen to network traffic or fake a network entity. Wireshark C/C++ Linux/Windows/macOS Wireshark is a network protocol analyzer. WiFi Pumpkin Python Linux/Windows/macOS/Android Framework for Rogue Wi-Fi Access Point Attack. Zarp Python Linux/Windows/macOS A free network attack framework. Exploit popular CMSs that are hosted online. WPScan Ruby Linux/Windows/macOS WPScan is a black box WordPress vulnerability scanner. Droopescan Python Linux/Windows/macOS A plugin-based scanner to identify issues with several CMSs, mainly Drupal & Silverstripe. Joomscan Perl Linux/Windows/macOS Joomla Vulnerability Scanner. Drupwn Python Linux/Windows/macOS Drupal Security Scanner to perform enumerations on Drupal-based web applications. Webpwn3r Python Linux/Windows/macOS Web Applications Security Scanner. CMSeek Python Linux/Windows/macOS CMS Detection and Exploitation suite - Scan WordPress, Joomla, Drupal and 130 other CMSs. Exploits for after you have already gained access. TheFatRat Java Linux/Windows/macOS Easy tool to generate backdoor and easy tool to post exploitation attack like browser attack, dll. Microsploit Shell Linux/Windows/macOS Fast and easy create backdoor office exploitation using module metasploit packet , Microsoft Office , Open Office , Macro attack , Buffer Overflow. Frameworks are packs of pen testing tools with custom shell navigation and documentation. Operative Framework Python Linux/Windows/macOS Framework based on fingerprint action, this tool is used for get information on a website or a enterprise target with multiple modules. Metasploit Ruby Linux/Windows/macOS A penetration testing framework for ethical hackers. fsociety Python Linux/Windows/macOS fsociety Hacking Tools Pack – A Penetration Testing Framework. cSploit Java Android The most complete and advanced IT security professional toolkit on Android. radare2 C Linux/Windows/macOS/Android Unix-like reverse engineering framework and commandline tools. Social Engineer Toolkit Python Linux/macOS Penetration testing framework designed for social engineering. hate_crack Python Linux/macOS A tool for automating cracking methodologies through Hashcat. Wifiphisher Python Linux The Rogue Access Point Framework. Kickthemout Python Linux/macOS Kick devices off your network by performing an ARP Spoof attack. Warning : I haven’t read them all so do not consider I am recommanding as I liked them. They just seems to provide useful resources. Reddit/HowToHack Learn and ask about hacking, security and pen testing. Reddit/hacking Discuss about hacking and web security. ax0nes Hacking, security, and software development forum. 0Day.rocks on discord Discord server about the 0day.rocks blog for technical and general InfoSec/Cyber discussions & latest news. Vulnhub - Has a lot of VMs to play with. some are beginner friendly, some aren’t. This repository is under MIT license.